Breaking the vicious cycle of perpetual indebtedness is the first step in halting the brutal exploitation of the poorest regions of the world. A very old concept, Jubilee (meaning a wiping out of debt at the turn of a century, but today meaning debt forgiveness), has been embraced by many citizens in response to the IMF/World Bank debts owed by the world�s poorest countries. Countries continue to send vast sums of wealth, mostly created by very poor industrial and agricultural working classes in their countries, to the richest financial institutions in the world, but never climb out of the debt hole. No wonder bankers love this system! � Fear of losing our job. � Fear of being unable to feed our families or heat our homes. � Fear of failing to pay the rent or defaulting on mortgage loans and losing our home. � Fear of being unable to pay our bills or credit card debts. This pervasive fear is even more hellish for those that are already homeless, jobless, or otherwise impoverished. The anxiety tax affects us in many less obvious ways, too. We do boring, stupid jobs because they pay us a wage, not because we think the work we do has any intrinsic value or purpose. We stand in endless lines, endure shoddy service and flimsy products, all to save a few bucks. We put up with countless absurdities throughout life, all because we are "forced to" by our fear of falling, our need to avoid economic catastrophe. The glue that holds this pernicious social order together is DEBT. If you don�t pay, you can�t play. Long forgotten now, it is telling that in medieval times "usury," or the charging of interest on loans, was considered sinful. The merchants of capitalism soon overcame that "obsolete" prohibition, and after several centuries the world they�ve created is a pyramid of social control based on wealth or its absence. The debt pyramid besets us individually; Americans as a rule are many thousands of dollars in debt to credit card companies and banks. But debt slavery as an international system of world capitalism is finally coming under widespread scrutiny. As citizens have awakened to the semi-secret dealings of the WTO, the World Bank, and the International Monetary Fund (IMF), social opposition has begun to focus on these institutional representatives. Wiping out national debts for the impoverished countries of the world is a good step in the right direction. Let�s go way beyond it and really alter the conditions of daily life. The propagandists of the American Way of Life have spent many decades trying to convince us that our well-being depends on the health of the Economy. The complex web of human activity that creates the material world is reduced to a series of abstractions, usually called "markets." The Market Rules. Period. Nothing must infringe on market logic, because according to the barbarians who (mis-)manage the world, the "health" of markets is the health of human society. If the numbers associated with measuring markets are going up, or growing, then by definition life is getting better. When the numbers game collapses, as it always does sooner or later, a depression comes like an act of nature, a catastrophic storm, which we are supposed to endure while markets "correct" themselves and the storm passes. 2.) It hides the actual planning and social designs imposed by a wealthy elite whose sole purpose is to maintain their power. The reality is that The Economy is a fiction which has been rewritten by the super-rich which serves only their interests. When pressured in the past, global financial leaders have arbitrarily re-written the numbers when they believed the economic system was in danger of collapsing. One set of assumptions about how much things are "worth" and who owes what to whom are suddenly and dramatically replaced by a whole new set of assumptions. Of course this kind of fiction has the weight of reality because, like all "confidence games," we want to believe in it. It is high time for the rest of us to change the rules to serve the interests of everybody. Wipe out all personal debts to financial institutions, everywhere, for all time. You might think wiping out all personal debts owed to financial institutions is a preposterous, utopian fantasy. The Committee for Full Enjoyment is here to argue for a society based on the reality of generalized abundance. We believe there is enough to go around. Ironically, the major obstacle blocking generalized abundance is our participation in The Economy. Scarcity is the main product of the World Market. A phenomenally rich world full of extraordinarily talented, creative people can make a life of abundance for all. The Economy stands in our way, physically and mentally. Our society is based on coercion imposed by false scarcity and debt, a thinly veiled form of slavery. We believe in a fundamentally different approach: a society based on the animating spirit of gift-giving everyday! A way of life not propelled by mindless consumerism and stressful overwork, but by the joy and intelligence sparked by generosity and giving. Few of us see our way of life as one among many possible choices for organizing society. Inevitably the discussion turns to assumptions about human nature: are people fundamentally competitive, anxious, possessive and individualistic? Or are they deeply compassionate, generous, creative, and cooperative? No doubt we each harbor all these qualities, but which characteristics are promoted, or reinforced, by the logic of our daily lives, that is, by the heartless dictatorship called The Economy? We don�t think the object of human life is an evenly balanced list of exchanges, nor is it to gain advantage at others� expense. The object of life is the full expression of our humanity, the passionate, ecstatic and even routine connection with others, and the creation of a good life for all. 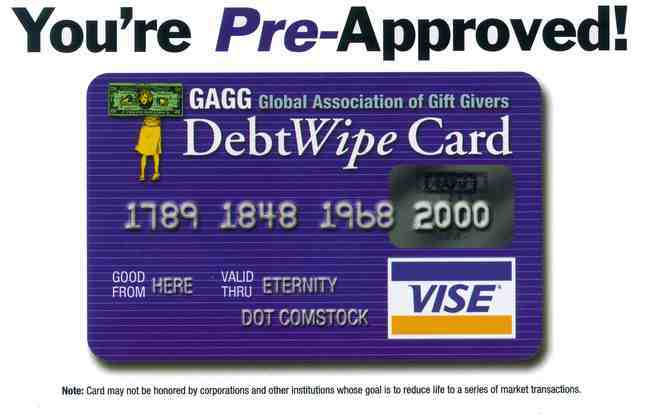 We are here in the spirit of a real alternative, maybe we should call it the Global Association of Gift-Givers (GAGG). The passion for life is the same passion that convinces that together we can make life what we want it to be. In the streets we have recreated the public commons, at least temporarily. We reject trade, free or fair, for trade reinforces the pecuniary mentality that reduces human life to the arbitrary measurement of its products, to the Economy. As free people we can live better, work less (and enjoy the pleasure of the work we deem worthwhile) and provide an unprecedented level of material comfort to everyone on the planet. "Fairness" is another idea being embraced by many, but the unexamined assumption seems to be that it�s possible to have a "fair" allocation of labor and wealth under capitalism. Capitalism is a social order based on a few people getting rich at everyone else�s expense. The centuries-long history of capitalism is one in which wealth has been created by many and concentrated in the hands of very few. This process has only been more exaggerated in the last ten years. We think it�s time to make a fresh start, on an entirely new basis. When we abolish the Economy, we will see the world with new eyes, new energy, new possibilities. We make the world everyday when we return to work for them. Why not make the world we want to live in instead? Click here for a larger version of the Debt Wipe Card!